This modded driver is designed for the Medion P82012 MD 85637 and will make the tablet work under the new versions of Windows again. You will recognize the malfunction of your currently installed driver if the Photoshop shape dynamics do not work, and if the MacroKeyManager icon doesn't turn to white after you connected the tablet to the computer. Install the latest official driver of Medion. It is version 4.10. Restart your computer and try to use the tablet. Install the driver for the superior model of your tablet (this will not work, but install a file which will make the original driver work again). "15 inches and 17 inches Pen LCD Monitor Driver, Q-Board Monitor Driver"
Reinstall the driver of Medion again (see step 1). If it doesn't work, please restart the procedure, until the MacroKeyManager changes its icon to white when the tablet is connected to the computer. Installieren Sie den aktuellen Treiber von Medion. Dies ist Version 4.10. Starten Sie den Computer neu und versuchen Sie das Tablet zu nutzen. Installieren Sie einen Treiber für ein Nachfolgermodells Ihres Tablets. Anschließend starten Sie den Computer neu und versuchen Sie das Tablet zu nutzen. Anschließend installieren Sie erneut den Treiber von Medion. (siehe Schritt 1). Gegebenenfalls wiederholen Sie diese Schritte mehrfach, bis der MacroKeyManager weiß wird, sobald Sie das Tablet einstecken. After this, you will find the control panel app in the category "Hardware and Sound" (but only if the tablet is plugged in). In Windows 10, you have to use the classic control panel. Sie sollten folgenden Registry-Patch installieren (siehe Hinweis), um das Systemsteuerungs-Icon in der Kategorieansicht zu sehen. 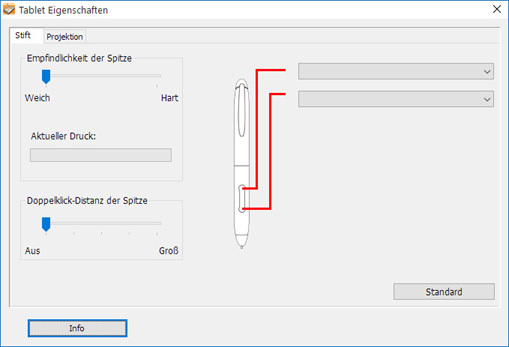 Anschließend finden Sie den Einstellungsdialog in der Systemsteuerung (In Windows 10 die Alte Systemsteuerung) unter "Pen Pad", allerdings nur wenn das Tablet eingesteckt ist. In der Kategorieansicht ist der Eintrag unter der Kategorie "Hardware und Sound" zu finden. Geben Sie folgendes ein: "Control Panel_Betteryless.exe"
Beachten Sie, dass das Leerzeichen sowie die Anführungszeichen Bestandteil der Eingabe sind! Following files were copied from the Waltop 2013 driver package (not designed and not working for the Medion tablet) into the latest 2011 driver package. These changes make the tablet driver compatible with Windows 10! Reason: The missing of this driver is the reason why the tablet isn't detected by the MacroKeyManager and why shape dynamics in Photoshop don't work. Reason: If used the first time, this User Mode driver will install tabletfilter.sys, which is only copied but not installed by the Setup. After this is done, you could theoretically use the original EXE file again. But it works both ways. Reason: The x64-variant does not work in newer versions of Windows. Just for completeness (not necessary), the x86 was also replaced. Additionally, following Registry information will be added, so that the control panel entry will be visible in the category view of the control panel. To automatically install this registry information, and run Setup, the executable SetupLauncher.exe was created. It will be started by the WinRAR SFX. Note that the control panel icon is only shown if the tablet is connected to the computer. This is the default behavior of the original driver, too. Without connected tablet, you also can't open tablet.cpl manually. At the moment the control panel app will be called "Grafiktablett-Einstellungen". You can change this string by modifying the entry in the registry patch above.